We got back today from camping in Dorset with two other families. I really had no qualms about taking Emily as she's always going on about "tent" and wanting us to cover her with an afghan, duvet, etc. and Holly is at that easy going age where she's not all that arsed where she goes as long as there's food and a clean nappy. Sue managed to cram everything we needed to into the car - including tent, sleeping bags, clothing, pushchair AND Holly's monstrous walker. We managed to push her around the campsite a few times, much to her (short lived) delight. The biggest pain was Emily unfortunately. While she was happy to dance around and explore, she really had no about dancing and exploring in the middle of the road, or running off to another part of the camp ground and doing her thing there. While she was awake, Sue and I had to keep one eye on her and one eye on what we were doing - which never really resulting in us relaxing, until after she was asleep. Emily having a sensory time on the beach. Holly was the star of the show with her vast appetite. No one could believe that a child that size could eat FOUR breakfasts (banana, cereal, toast, custard/yoghurt) and still be up for whatever ANYONE else was eating. I'm thinking/hoping she's just going through a growth spurt and that we're not going to have a Clifford the Big Red Dog on our hands ("he eats and drinks A LOT"). 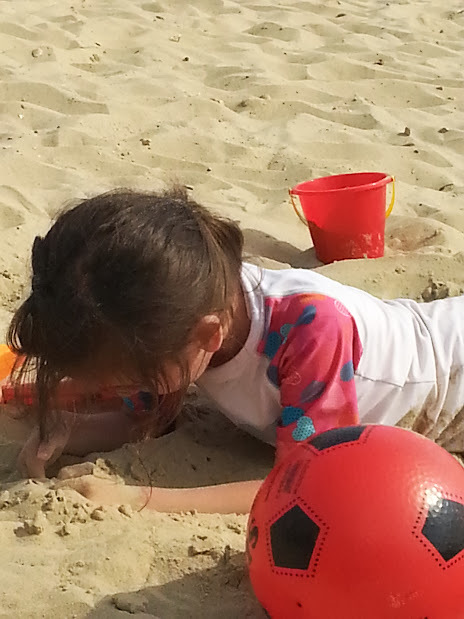 We capped the holiday off by spending the day on the beach near Sandbanks (near Poole). Apart from getting sand EVERYWHERE, it was a nice relaxing way to spend the day. Emily decided that the feel of the sand was really nice and proceeded to bury her face in it, as well as run her feet and arms in it. The shower that evening was FILLED with sand. We also got her to eventually accept the water and have a bit of a dip. Small steps, even though she likes swimming (in a pool). Glad we could get away and it was a good relaxing time (apart from chasing Emily) for everyone involved.